Today I had the opportunity to talk to the RIPE meeting crowd about my use of the RIPE NCC Atlas measurements infrastructure to simulate the NOMA v6 health metric measurement. 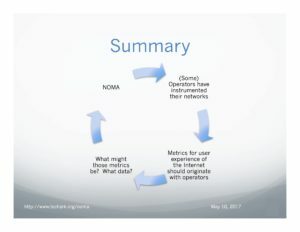 NOMA is based on operators instrumenting their networks. The RIPE Atlas infrastructure, with its probes distributed throughout a variety of networks, is a good platform for illustrating what could be done, with live (if somewhat limited) data. This is the persistent reference page for the Internet Measurements Landscape (2016) paper. Please use this page’s URL to refer to the paper (http://www.techark.org/internet-measurements-landscape-2016-systems-approaches-and-a-comparative-framework). Measurements of networks: what more could there be in the world? Posted on September 20, 2016 by Leslie Daigle | Comments Off on Measurements of networks: what more could there be in the world? 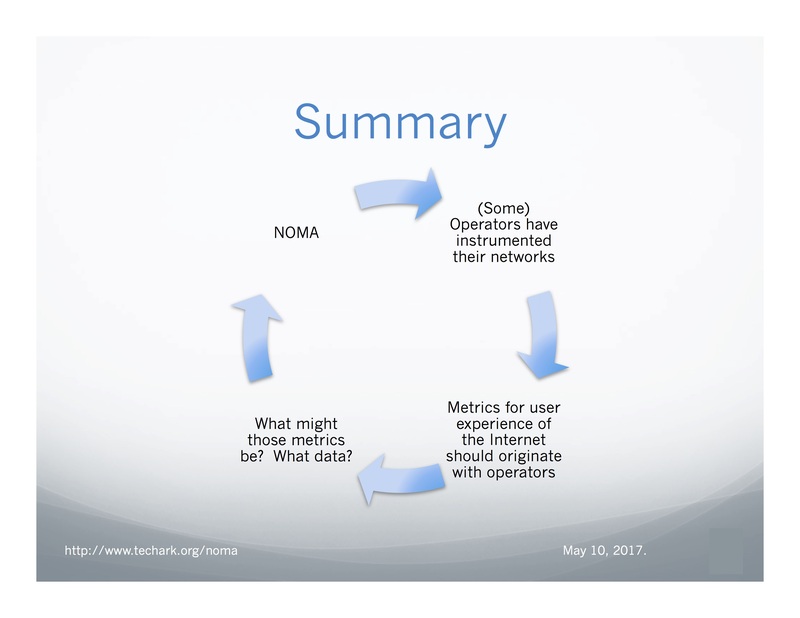 The TechArk NOMA (Network Operator Measurement Activity) is focused on developing operator-driven network health measurements through the definition and promotion of self-instrumentation and information sharing.) This is all with a goal of ensuring a better, shared understanding of what “good” Internet looks like. An important question is whether there is anything left to measure in operator networks? At an invitational workshop in June of this year, the answer seemed to be “why, yes, there is”. Various measurements are made of and across networks today, but they are often done without the specific involvement of the operators of those networks, and therefore have to make guesses or generalizations about them. On the flipside, there’s a lot that goes into the customer’s experience of the Internet that can be adjusted and improved if network operators have a comprehensive instrumentation of their own networks. The report from that workshop is now available here: http://www.techark.org/wp-content/uploads/2016/09/20160831-WorkshopReport-Final.pdf . Have a read through to see more about the experiences of one network operator that has implemented such instrumentation and possible paths forward to achieve the NOMA goal. Comments Off on Measurements of networks: what more could there be in the world? The Internet has been measured and analyzed since the first connection was made between networks. Since measurement activities are shaped by everything from the intentions of the people taking the measurements to the vantage point of network and service operators, there are many different approaches and activities that are underway today that make up the landscape of “Internet measurement activities”. NOMA is tackling one corner of the landscape, but understanding its value is dependent on an awareness of the bigger picture. To that end, we’re drafting a paper that aims to provide an overview of existing Internet measurement activities, approaches, challenges and activities, to build out a map of that measurement landscape. It is aimed at the general reader with an interest in the topic, including policy makers, measurement experts wishing to position their work in the landscape of such activities, and network operators seeking to understand available tools, services and practices with regard to measuring the Internet from their network’s perspective. With this post, and subsequent ones over the coming weeks, I’m putting out draft text and asking if you would kindly share your thoughts on any errors or omissions, or even just general insights. Comments to measuring<at>techark.org would be most appreciated. An unexpected benefit of World IPv6 Launch in 2012 has been an ongoing look into the state of IPv6 deployment in access networks around the globe, as measured by participating websites. One of the guiding principles was that those making a public commitment to IPv6 deployment had to deliver, and it had to be publicly verified. We established a dashboard that indicated whether or not the website was delivering IPv6 on its homepage. Those websites in turn measured the extent to which the access networks were delivering IPv6. In Buenos Aires the other week, I had the opportunity to talk through the principles of NOMA with some measurements people and Internet operators, who were meeting to discuss IPv6 measurements in general.